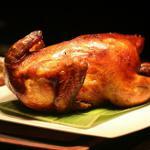 Roasted duck has been Chinese speciality since before 600. Only in the mid of 1300s Peking duck gained world popularity. Today roasted duck is served in every Chinese restaurant and it's not a problem to try this dish. Peking duck is known for its crispy skin that is usually served apart from meat. The bird has to go through a specific process to get this brown and crispy skin. First duck is boiled until it changes color. Then it is rubbed with molasses-based glaze, seasoned and left to dry for a couple of hours. Drying will ensure that duck will have its crispy skin. Then the air is blown under duck's skin and finally vertically roasted in oven until skin becomes golden brown. Peking duck is usually served with pancakes, cucumbers, scallions and hoisin sauce (it is also known as Chinese plum sauce). Visit any Chinese restaurant on National Peking Duck Day or if you're adventurous enough, try cooking this dish at home.